I have never been very big on going out to dinner on Valentine’s Day, or making a big production of the day. But I do love hunkering down at my house with my sweet husband, and making a nice home-cooked meal. 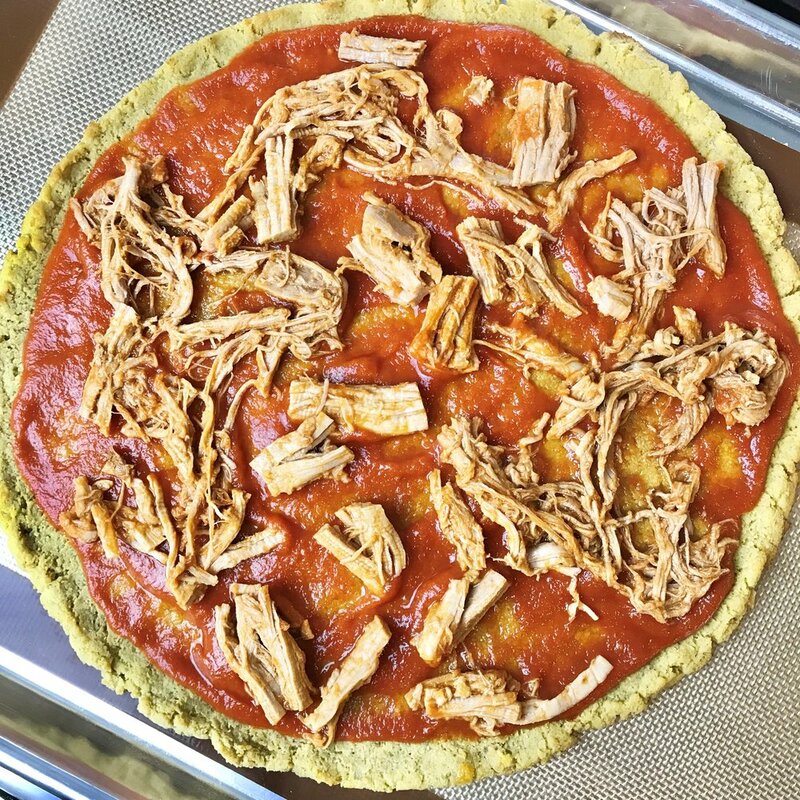 Chris LOVES pizza, so this year I decided to make him a healthier spin on his classic favorite. The crust was super quick and simple with only three ingredients. I would normally make my own BBQ sauce, but in order to fit everything in the 10-ingredient window, I used my old standby, Stubbs (For my go-to homemade BBQ sauce, click here!). 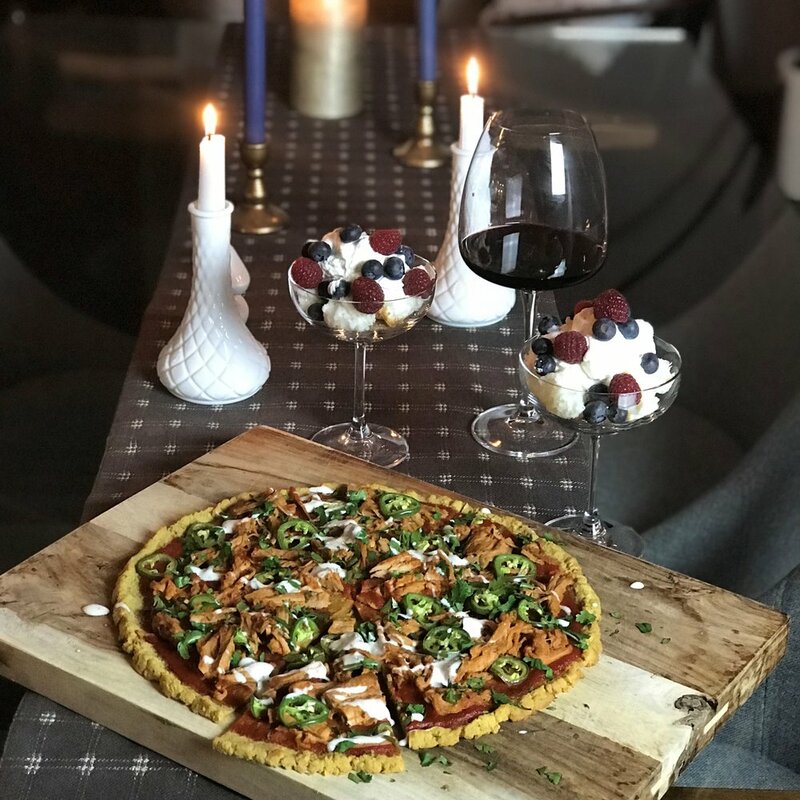 Valentine’s Dinner for my sweet man was made up of BBQ pork pizza on plantain crust, angel food cake with fresh berries and whipped cream, and wine! I put my pork in the Crock Pot with just enough of the sauce to come ¾ of the way up the side of the meat, then I cooked it on low until the pork was shred-able. Depending on the size and cut of meat, times will vary. The plantain crust all came together in my food processor—melted butter, green plantains, and salt. The crust was pressed out onto a parchment-lined sheet pan, and baked for 20 minutes before adding my toppings. 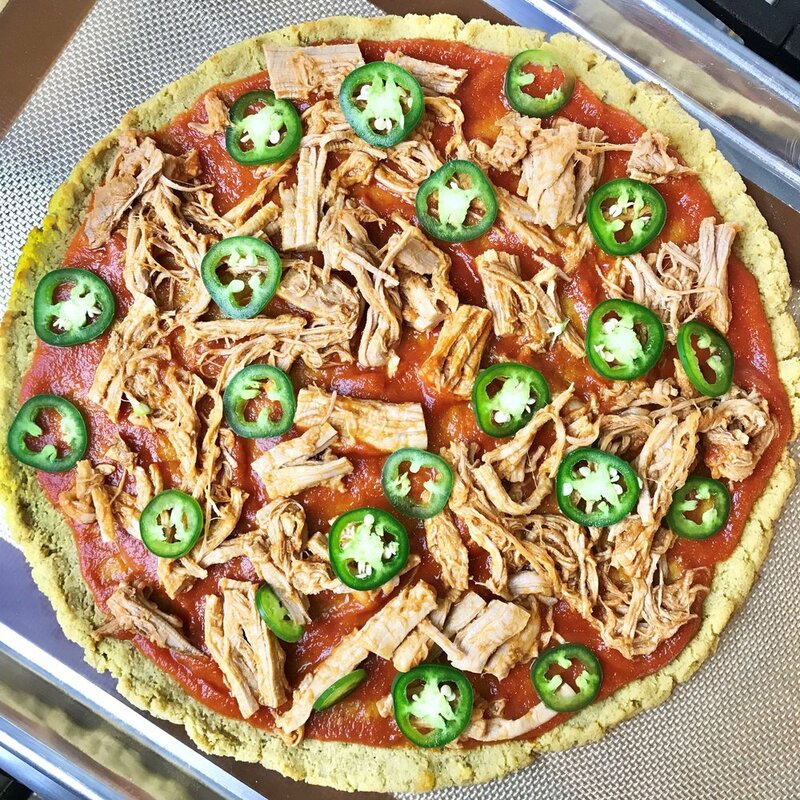 I layered my pie with BBQ sauce, pulled pork, and sliced jalapenos, then baked until hot, and finished it off with ranch and cilantro. The dessert parfaits were pieces of store-bought angel food cake (yes, pastry chefs buy premade cake sometimes!) and whipped cream, topped with fresh berries! I didn’t add any sugar because the angel food cake and berries were plenty sweet on their own. Since I can’t drink right now, I served my dessert in a champagne glass, to feel a little bit fancy! The most important part of creating a welcoming meal for any occasion is making sure that it is inviting and made up of food and drink that make the other person feel loved. 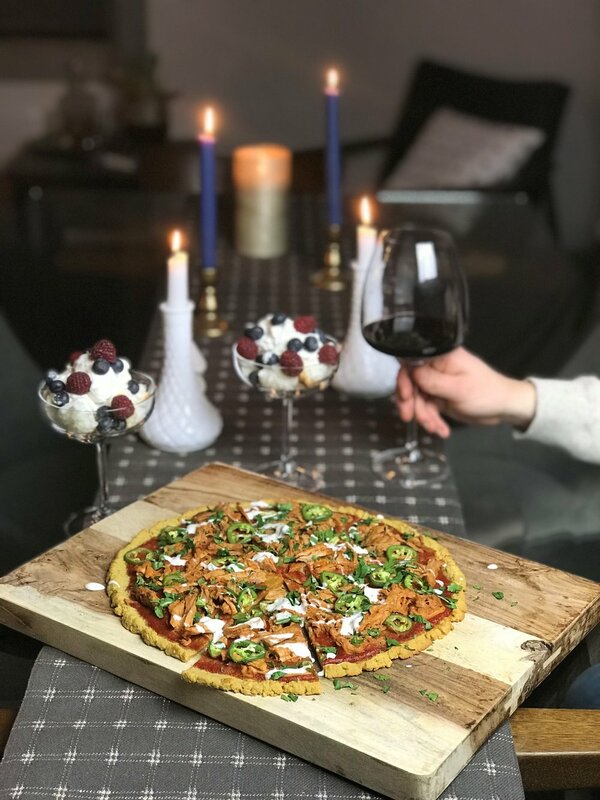 Even though this Valentine’s dinner was simple, it was the perfect meal for my husband and I to sit around, laugh, and enjoy each other’s company. What is your go-to Valentine’s Day dish? I would love to hear what you’re making—comment in the section below! Preheat the oven to 350°F. 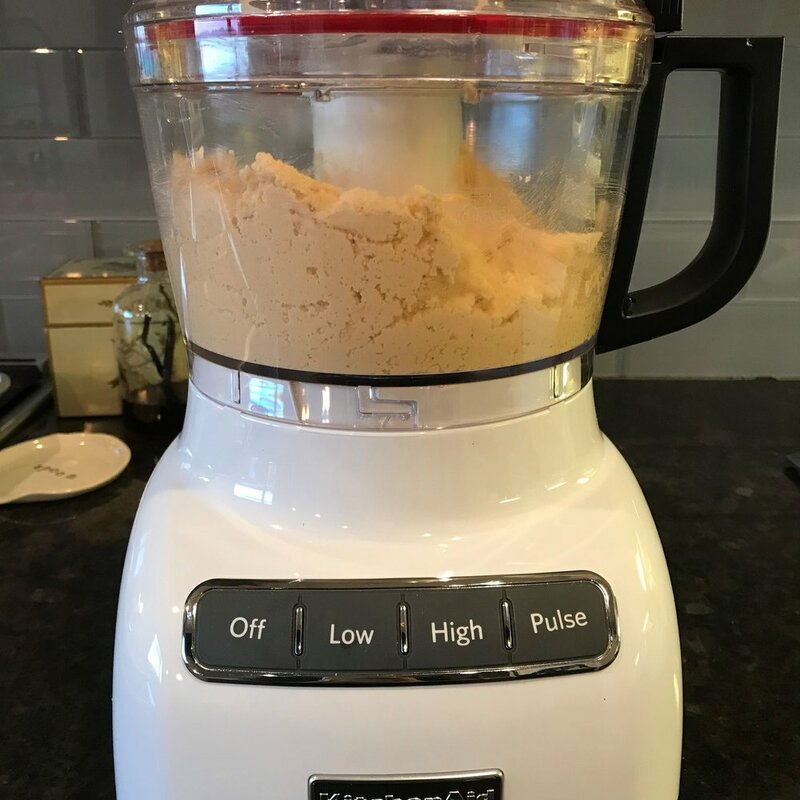 To the bowl of a food processor, add the plantains, butter, and salt, then blend until the mixture reaches a paste-like consistency. Scoop onto parchment paper and shape into desired size, about ¼-inch in thickness. Bake until the center of the crust begins to get crisp—about 20 minutes. Then add sauce and toppings and bake until heated.